from 3 pcs. 4,63 EUR ea. from 10 pcs. 4,31 EUR ea. The search for paper clips and screws has finally come to an end! Small metal items of all sorts can now be stored safely and in style in the big rectangular magnetic bowl (24 x 13 cm) made of chrome steel. The chrome content makes the steel pretty resistant to water, water vapour, humidity as well as weak acids and lyes. The bowl has two rubberised feet on the bottom side, which contain the magnets. The magnets guarantee secure hold and the rubber prevents scratches on the surface the bowl stands on. The magnets keep metal objects in the bowl, and you can attach the bowl (thanks to the magnets) to all magnetic surfaces in the workshop. 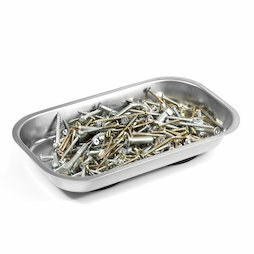 Many screws, nails, bits, paperclips and other small metal are magnetic. They all adhere strongly to this bowl, don't get lost and are always handy. Despite the heaviness of the bowl (500 g), it can be attached upside down or sideways on a steel cabinet. As if by magic, the metal parts are held tightly and don't fall down.